Art for the home and garden made with upcycled glass. Garden art, bird feeder, or candle holder. Assembled glass piece made with re-purposed glass. Asian inspired. Hostess gift. Cupcake display. Cupcake stand. Wedding cupcake stand. Two-level cupcake display. Cupcake pedestal stand. Glass cupcake stand. Angel. Garden art. Garden angel. Memorial for a loved one. Memorial angel. Garden art. Garden totem. Glass totem. Assembled glass sculpture suncatcher. Announcement Each item in my shop is one of a kind, assembled with heirloom or vintage and found glassware, re-purposed for contemporary living--some with a little whimsy. These creations are designed for indoor or outdoor use. Many items can have multiple uses. For instance a pedestal stand outside can be a bird bath or bird feeder. Indoors, it can be a cake stand, chair-side table, or plant stand. Some of the flowers can be hung on a wall or fence, but indoors on a table top, they can be a candle holder or centerpiece. Or they can just be what they are--an interesting and curious use of heirloom or vintage glass. No doubt you may find other purposes for what catches your eye. My re-purposed art adds color and sparkle in landscaping among plants, along walkways, or near doors. If the design allows, an LCD light with battery can provide a beautiful glow at night. Indoors they are great decorating pieces that add sparkle, color, and light among plants. Similar items grouped together can be a spectacular display and conversation starter. And of course they make great gifts for weddings, a new home, and for other special occasions. Each item in my shop is one of a kind, assembled with heirloom or vintage and found glassware, re-purposed for contemporary living--some with a little whimsy. Cake plate.Cake stand.Blue cake plate stand.Pedestal cake stand.Wedding cake stand. Blue wedding cake stand. Cupcake stand.Blue glass. Cupcake stand. Wedding cupcake stand. Two-level server. Cupcake server. Cupcake plate. Pedestal stand. 2 tier stand. This piece sure was a beauty! This is my second piece from this seller. Gorgeous for outdoor gardens, but even better indoors. This artist is a pleasure to do business with. Excellent communication throughout the process. Bird bath. Bird feeder. Garden art. Garden sculpture. Golden glass. Amber glass. "The Aurelia" is made with repurposed/upcycled glass. The picture does not do this justice. It is a truly, amazingly gorgeous piece. It’s a birdbath I gave as a gift - she thought it was so beautiful that she is using it indoors as a side table. This artist does truly special work and seems like a very warm, caring person. I totally recommend this artist and would definitely buy again. Truly unique and one-of-a-kind masterpieces. What a wonderful gift!!! Garden art. Bird bath. Bird feeder. 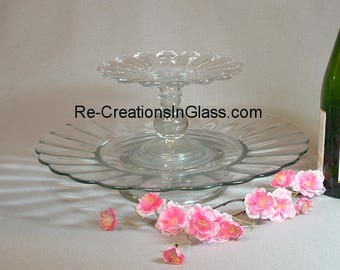 Cake stand.Wedding cake stand.Glass wedding cake stand.Cake plate.Pedestal cake.Pedestal server.Cupcake plate with upcycled glass pieces. These creations are designed for indoor or outdoor use, and some can have multiple functions. Inside, an item can be a cake stand, a chair-side table, or a plant stand. 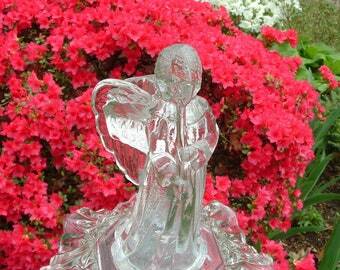 Outside, it can be a bird bath or garden art. Other items can be a candle holder, a centerpiece, hung on a wall or fence, or used as a sun catcher in a garden. Or they can just be what they are--an interesting and curious use of vintage or recycled glassware. No doubt you may find other purposes for what catches your eye. My re-purposed art adds color and sparkle to landscaping and among indoors plants. Similar items grouped together can be a spectacular display and conversation starter! And of course they make great gifts for weddings, and other special occasions. Buyers have 48 hours after receiving an item to contact me regarding a return. In the event of a return, the item must be returned in its original packaging. The customer is responsible for the return shipping charges and insurance fees. When the returned item has been received and determined to be in the original shipping condition, a refund will be issued minus Etsy and/or PayPal fees and the initial shipping expenses. The direct Etsy check or PayPal are the preferred methods of payment. You can use a credit/debit card on PayPal without setting up a PayPal account. Payment is due at the time of purchase. Your order will be shipped only after the payment has cleared. A sales tax of six percent is automatically charged to Maryland orders. Any orders unpaid after two days will be cancelled. All my creations are heavy yet breakable, so they need to be packaged for shipping with great care. Boxes are specially ordered with double strong tops and sides and some items are double boxed--all to withstand the forces they may be exposed to during shipping. I sure wouldn’t want you to receive it broken! An insurance fee is included in the cost of shipment. To ensure items you order arrive to you safely, each needs to be shipped separately. Under most circumstances, SHIPPING COSTS CANNOT BE COMBINED. If you are interested in purchasing more than one item at a time, please contact me so I may evaluate if they can be shipped together and to adjust your invoice. Otherwise, please note the shipping cost for each item as listed in the item profile. If you live within a 30-mile or so radius of Annapolis, Maryland, arrangements can be made for delivery or pickup with no charge incurred. The shipping price quoted is usually for Priority Mail to the lower 48 United States only. It may take as long as eight days, depending on the distance from Annapolis, Maryland. IF YOU WANT EXPEDITED SHIPPING, PLEASE CONTACT ME. Gift wrapping and card enclosures are available upon request for the smaller items (less than 15 inches in height) for an additional fee. If you check out with PayPal, please be sure your Paypal address matches your Etsy address. I will ship to your Etsy address unless you tell me that you want your item shipped elsewhere. Please help prevent items being shipped to the wrong or an old address. I purchase insurance from the shipper when I send your purchase. While I am not responsible for damaged shipments, I will reimburse you for the cost of the item plus shipping cost when the shipper honors the insurance claim. If an item arrives damaged please photograph both the item and the packaging and KEEP THE ITEM AND ALL PACKAGING until the issue is resolved. If you would like to be notified when additional creations are posted, of announcements of sales or special promotions, please add your email address to my website at www.recreationsinglass.com. Your address is not viewed or shared by others. All components are from a smoke-free studio and thoroughly cleaned before being assembled into a creation. The materials used are heirloom, vintage, and found glassware. Please understand that because they are being re-purposed, they may not be in absolutely perfect condition. I inspect them closely, but if you see a scratch or wear pattern that I missed, please accept this as part of the charm of these creations.